The holidays are here, and it's time for a new wall. I was searching through AP and found this scan that I wanted to vector straight away! I haven't seen Code Geass yet, but hopefully I'll get the chance to watch it soon. Well, about this wall... I'm actually quite proud of it, for once. I've never spent so much valuable time on a single wall before, and this one took forever, since I'm the sort of guy who tends to finish in a day or two. Vectoring was a pain, I can't overstate that enough! But I guess it was well worth it -- the final product looks fantastic. The vectoring took me four days. Lelouch and Kallen were annoying to vector -- it was all good fun I suppose. Hm, you've darkened the colors, and cleaned up the original scan. The brown of the chess board now doesn't look natural, and I think some wood texture there would be better? Doesn't seem like much work really, mostly cleaning the scan, and changing the resolution, plus some dark shadows, and pretty much nothing original in here. I think it would be better as a vector, not a wallpaper. but yours look good and i don't understand 4n0th1n9...this is a vector isn't it?well whats the problem of 4n0th1n9? Love the thin outlines (do you use Illustrator?). I think the chessboard looks good 'cause the shadows on the characters are also dark. and nice coloring. Captured the feelings in the scan, nice job. Good vector and if people mistake it for the scan that probably means you did a very good job or they didn't fullview, lol. I kind of agree with Kitten, Suzaku look so tiny, I know it's because of depth and such but it looks odd. sugoooooooooi! This work is really sugoi! Great colors and quality! I agree, it's a good vector! Nice work on being so neat with the lines and what not. However, something I see that is all too common lately is people just vectoring a scan and making no changes with it, which is basically what is going on here. >_< I want to see great vectors, but I also want to see at least a little bit originality, as well. Plus, the scan really wasn't in need of being vectored in the first place, it was actually really great quality. It's always more impressive to see vectors of scans that are just completely lost in a mess of text and other stuff like that. Anyways, just speaking my mind, hopefully I didn't offend you or anything. 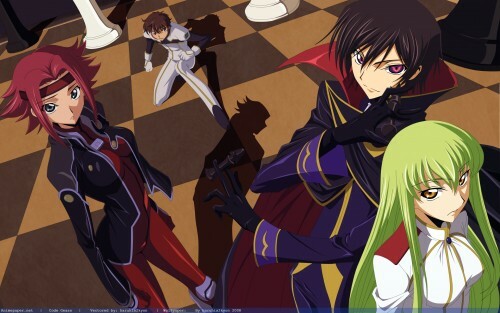 exelent luluch is the king, cc the queen, and kallen? Thank you for the Amazing Pic!